Ukuleles are already very portable, but the bumps and bruises of travel can wreak havoc on acoustic instruments. I’ve already constructed a few travel ukuleles. The first was a prototype (Home Depot Travel Ukulele). The second ukulele improved upon the first (DIY Travel Ukulele). 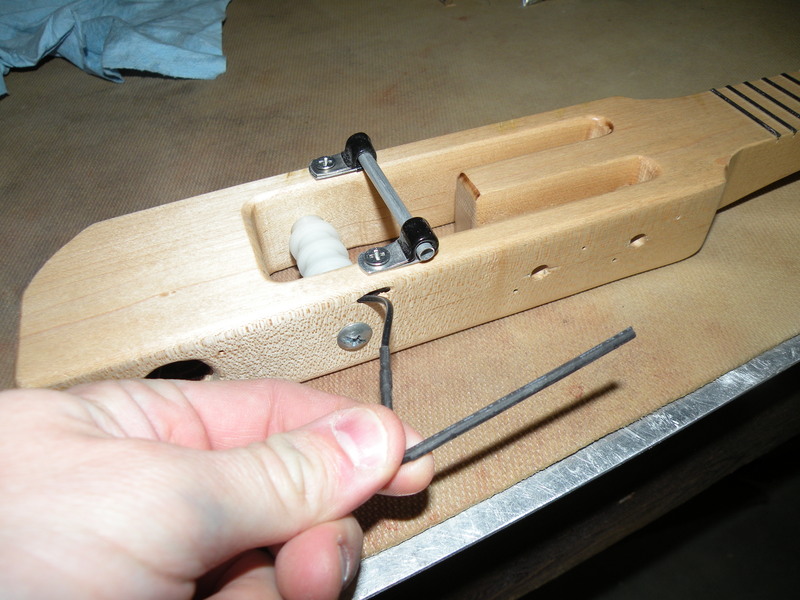 Both of these solutions only required basic tools along with common parts and wood. After slowly acquiring more tools and expertise, I wanted to make another travel ukulele. I took the things that I learned from the other builds and implemented them in this travel ukulele. I started out by sketching out the design on paper. The scale length was 15 inches (concert scale). 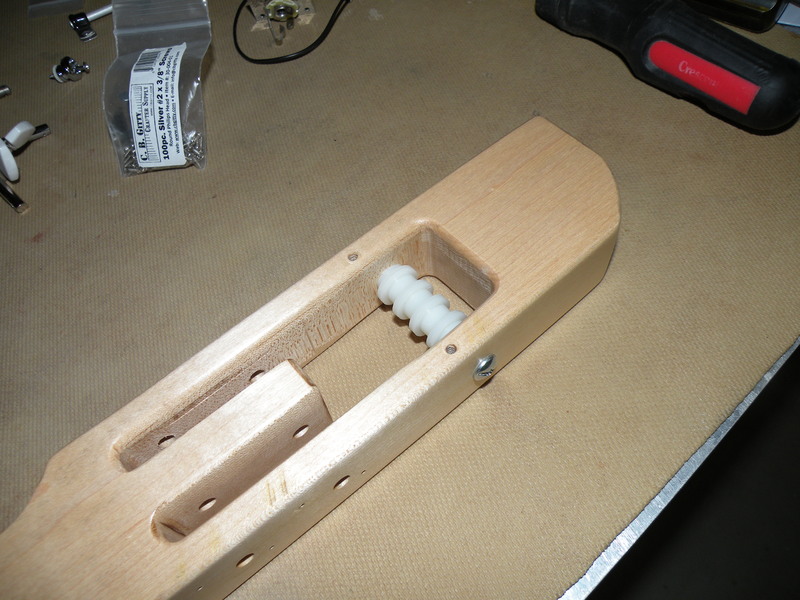 There were two tuners on each side using a slotted, classical style. At a specialty hardwood store, I picked up a beautiful 1.5 in X 5 in (3.8 cm X 12.7cm) piece of hard maple. The outline and interior were cut with a scroll saw. The overall length of the wood is a little over 20 inches. The widest point is 2.5 inches, and it is 1.5 inches thick. I slotted the frets, rounded over all of the edges except for the fretboard, drilled all of the holes, and spokeshaved the neck until it was comfortable. The entire assembly was then given a few coats of nitrocellulose lacquer. The lacquer finish really brought out the natural beauty of the wood. 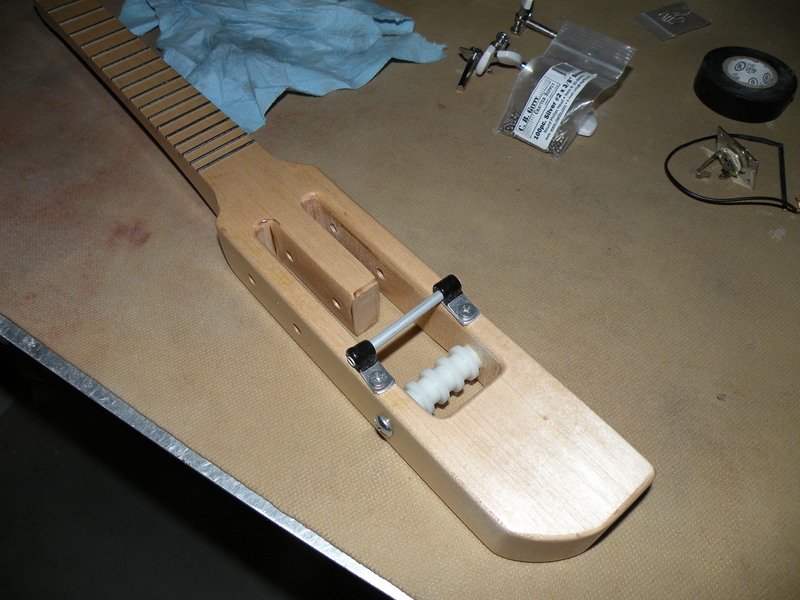 After the strings go over the bridge, they need to be directed back towards the tuners. I used a handful of nylon spacers and washers along with some “Chicago bolts” (I also saw them referred to as “barrel nuts”) to direct the strings. The bridge is a small aluminium tube that was attached to the body with two metal cable clamps. 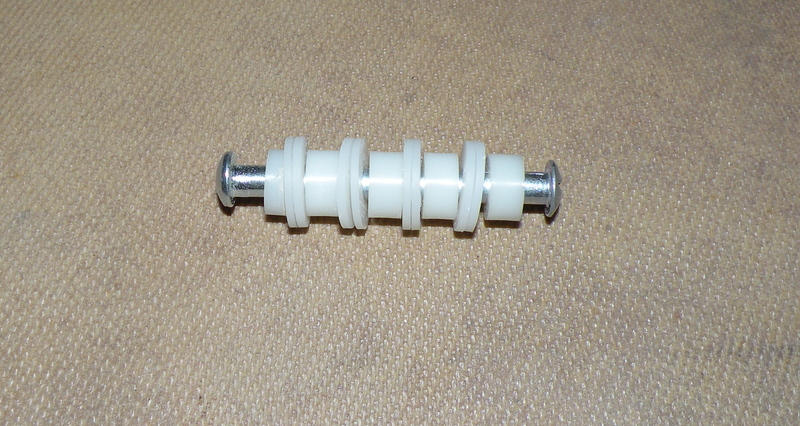 A rod piezo was inserted into the rod. The wires from the piezo were fed through a small hole drilled into the jack cavity. This pickup is very responsive. The combination of the lightweight, but rigid, aluminium and the rod piezo work well together. The piezo wires were soldered directly to a 1/4 inch mono jack. It’s ready for strings. I decided to use some of D’Addario’s new T2 Titanium acoustic ukulele strings. They are “bright” sounding strings that are working great for this application. In addition, they are transparent with a pleasant purplish tint which add a bit of razzle-dazzle to the end product. The travel ukulele is complete. With all of the hardware, it is 20.5 inches long, 3 inches wide, and 2 inches thick. I’m very pleased with how it turned out. I set out to make a sturdy and portable ukulele, and I met my goal. Not only is it a legitimate instrument, it could also fend off zombies, or serve as a cricket bat in a pinch. To see more of my videos, subscribe to my YouTube channel (Circuits and Strings). 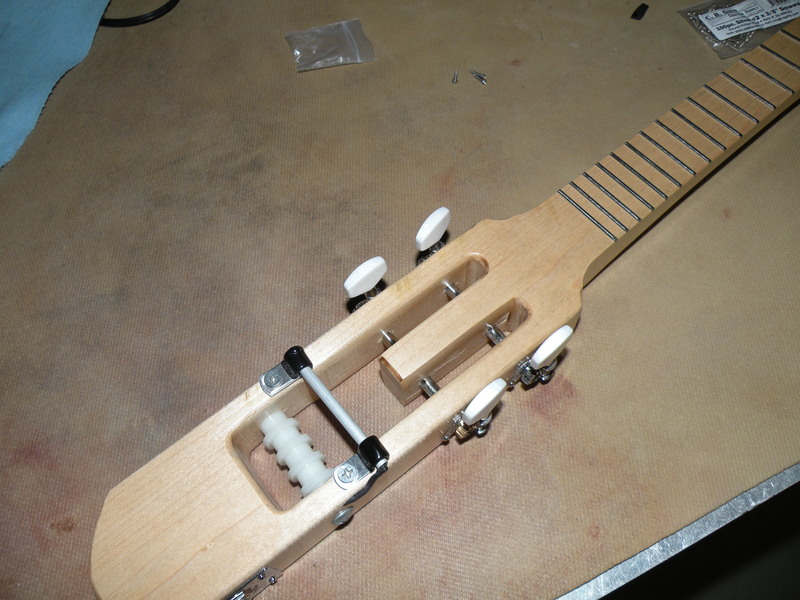 This entry was posted in Daniel Hulbert's posts, General News, Smaller projects by Daniel Hulbert by CircuitsAndStrings. Bookmark the permalink. She’s a beauty! Is your nut fret exactly the same as the others? Thanks! Yes, the nut fret is the same size as the others. How wide is the neck at the ‘nut’ fret? It’s around 33 mm (1.3 inches) wide at the nut. Hmm, my current acoustic concert uke is a bit over 35mm, and I find it too narrow. I’m thinking of building one two, but with 38mm nut width. Thanks for the inspiration. 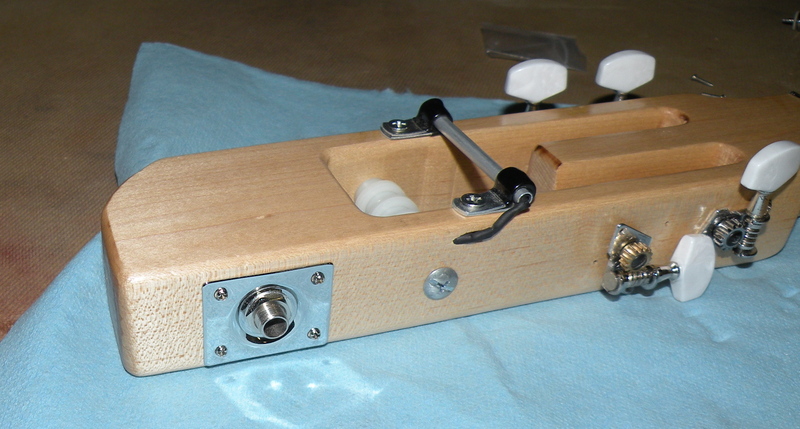 I built one that looks like the risa but wanted geared tuners like this one. I thought they would be in the way. are they in the way of strumming hand on this? I’d love to see what you made. In regards to the tuners, I mounted them just high enough for the knobs to turn. I strum this ukulele at around the 12th fret. The tuners don’t get in the way at all. How much would you charge to make one for me? I have no tools whatsoever.. Unfortunately I’m not doing custom jobs right now. I’m enjoying the freedom of exploring interesting one-off instruments a little too much at the present time. I’m inspired to build one! Is a pre-amp needed to connect the travel uke to a bluetooth transmitter or to a guitar interface for a tablet? I’ve plugged it into an iPhone interface without a preamp, but I bet you would need one for a bluetooth transmitter. No preamp wouldn’t work for headphones, but I’m making one that has a built in headphone amp. I’ve just finished building a modified version of your latest travel uke with a built-in Ruby amp. 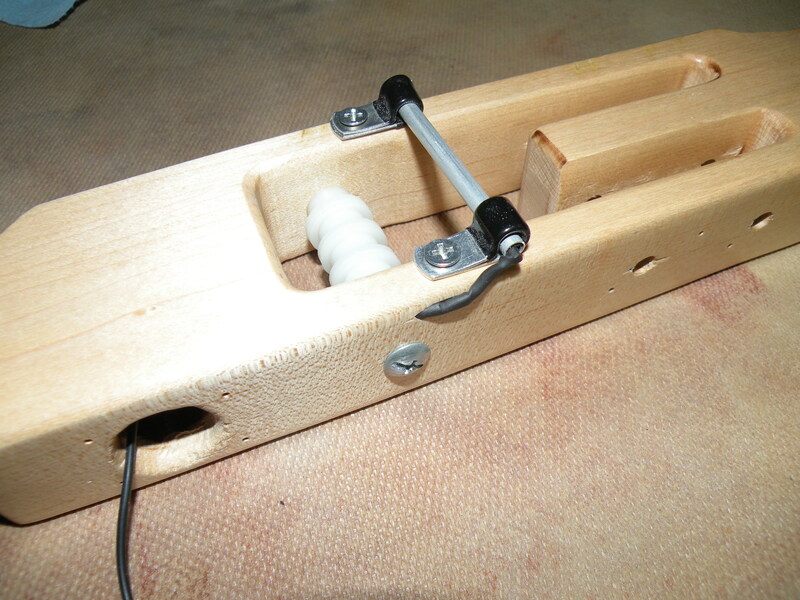 I used friction tuners, I had problems with the tubular bridge, so built a wooden bridge with the rod piezo sandwiched under a piece of square cross section brass tubing. I made notches on the bottom of the bridge, so I didn’t need the plastic washers to separate the strings. I used a standard 1/8 inch stereo jack for headphones, it also works well plugged into an mp3 player amp with a patch cord.